On March 8, 2017 nearly 100 members of the Dutch Overseas Chinese TCM Association (hereafter referrd as “Vereniging TCMned”) from all over the Netherlands gathered in Shenzhou Open University of TCM (hereafter referred as “Shenzhou University”) to attend a high-level academic seminar titled as “From the hometown of Acupuncture and Moxibustion” by experts from World Federation of Acupuncture-Moxibustion Societies (hereafter abbreviated as “WFAS”). At the same time, the signing ceremony of the “WFAS—Chinese Acupuncture and Moxibustion Joint Educational Heritage Education Base in the Netherlands” was held in Shenzhou University. Dong Zhilin, president of Vereniging TCMned, first gave a welcome speech. Wang Weixiang, chairman of the Dutch Society of Chinese Medicine (hereafter abbreviated as “NVTCG ZHONG”) and advisor of Verening TCMned; Ren Tianrong, vice chairman of Vereniging TCMned chaired the meeting. This academic seminars include four topics from the following four experts. The first speech was from Professor Liu Baoyan, principal researcher and executive vice president of the China Academy of Chinese Medical Sciences (CACMS), and chairman of the WFAS. His topic was “Acupuncture Treatment for Refractory Constipation”. The second speech was from Dr. Fang Yigong, vice chairman of the World China Federation of Integrative Medicine and Longevity and his topic was “Acupuncture Treatment of Premature Ovarian Failure”. The third speech was from Dr.Wang Jingjing, professor of Acupuncture Institute of China Academy of Chinese Medical Sciences, director of Pain Department in the Acupuncture Hospital. Her speech was about “Clinical Application of Electroacupuncture”. The four speech was from researcher Jing Xianghong, deputy director of the Institute of Acupuncture and Moxibustion, China Academy of Chinese Medical Sciences. Her topic was ” The dose-effect relationship between acupuncture and moxibustion on gastric motility and its mechanism”. Each of the four guest speakers is top expert in their own academic fields. They combined theories with clinical practice, making it easy for participants to understand and benefit from their profound knowledge. 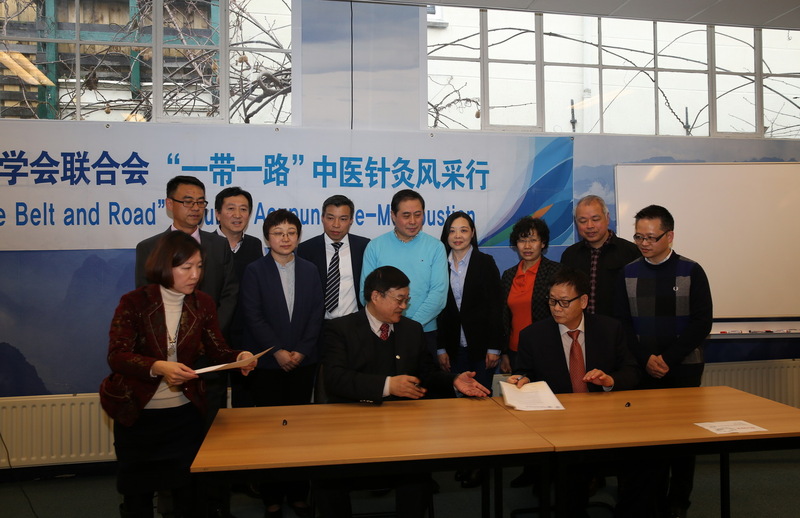 At lunch time, all participants witnessed the signing ceremony of the “WFAS—Chinese Acupuncture and Moxibustion Joint Educational Heritage Education Base in the Netherlands” between WFAS and Shenzhou University. After the academic conference, an evening banquet to “Welcome the WFAS experts by Dutch Chinese TCM community ” was held at the Sea Palace in Amsterdam. 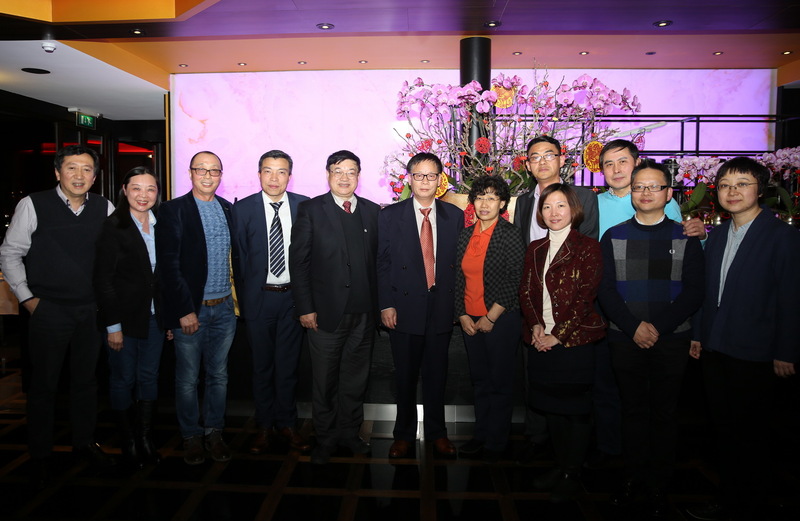 Zhang Xinmin, science counsellor of the Chinese Embassy in the Netherlands; Elsinga, president of NVA (Netherlands Association of Acupuncture); and Ohmstede, president of the German Association of Traditional Chinese Medicine; attended the banquet and expressed their welcome to the expert team. Dong Zhilin, president of Verening TCMned, opened the banquet “Acupuncture was introduced by Dutch people to Europe in the 17th century. At the moment, there are more than 4,000 acupuncturists in the Netherlands, and 90% of their clients are Dutch locals. The Netherlands is the fastest growing and best country in Europe for Chinese medicine practice. He called for the Chinese medicine community in the Netherlands to unite and appreciate this good situation in order to bring the education and medical practice of acupuncture to a higher level. During the opening speech of the banquet, professor Liu Baoyan, chairman of the WFAS, introduced the current situation of WFAS and its future tasks: to cooperate with the four major medical journals in the United States, to set up of a data center, to establish of acupuncture clinical registration center, to publish the clinical research books of WFAS, and to develop overseas members clubs and overseas associations. He wished that acupuncture can enjoy a better and healthier development. Counselor Zhang Xinmin gave a brief speech on behalf of the Chinese Embassy in the Netherlands. He said “Acupuncture and moxibustion is one of the national treasures. Everyone at present is working hard to pass on and develop this cultural heritage. The academic conference by WFAS today gaves a lot of valuable knowledge to local practitioners and this also strengthen knowledge exchange activities among different associations. Wang Weixiang, the first Chinese president of the 25-year-old NVTCG Zhong (one of the two authoritative societies in TCM industry in the Netherlands) emphasized that “The legalization of acupuncture is a challenge for all TCM colleagues. I hope all my colleagues will stick to the principle of strict quality control in the future development of acupuncture in the Netherlands. NVTCG Zhong is willing to work together with other regular TCM associations to achieve this goal. Elsinga, chairman of NVA (Netherlands Vereniging van Acupunctuur), affirmed the contribution made by Dong Zhilin, chairman of Verening TCMned, in his great efforts to develop Chinese medicine in the Netherlands. He also mentioned that the current election campaign in the Netherlands is on the spotlight. The “medical insurance” which involved vital interests of the people and the national interest will surely be a contentious issue between the parties. Acupuncture treatment has already been partically covered by medical insurance as an alternative therapy. But only by doing it better and better, can acupuncture remain its foothold in the Netherlands. 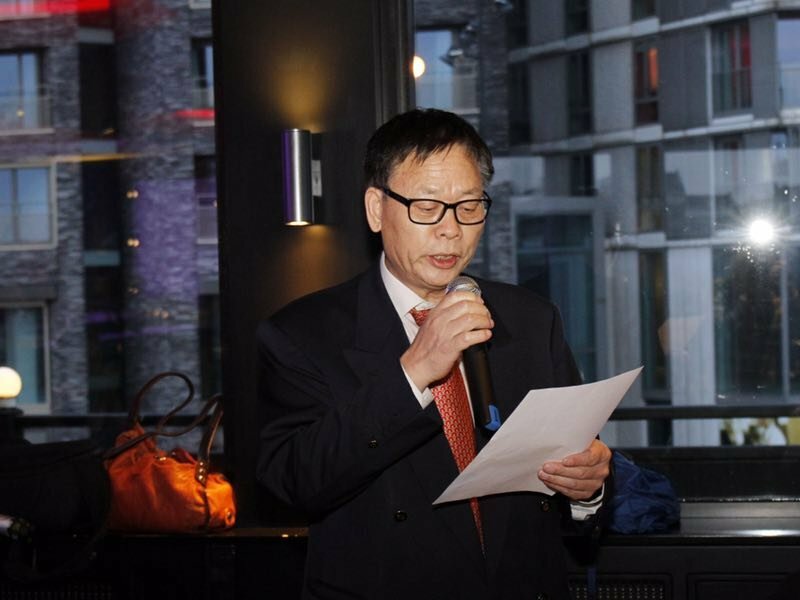 Ohmstede, chairman of the German Medicine Association of Germany, also made a brief statement, fully affirming the important contributions made by Mr. Dong Zhilin in his long-term efforts in the development of Chinese Medicine industry in the Netherlands and Europe. Subsequently, Professor Liu Baoyan, president of the WFAS, presented valuable nine-needle souvenirs to the chairmen of NVTCG Zhong and NVA on behalf of WFAS. The dinner was of a great success, full of warm atmosphere during the whole night.